You'll find West Bay at the Northern end of the famous, powdery Seven Mile Beach. This district, with it's endless stretch of waterfront, offers peace and quiet for beach bums who want to escape the crowds. It's not all lounging out and taking in the view, there's just enough to do in West Bay to fill those lazy, Cayman days. Here's how we'd spend our time in this character-filled district. Wake up to watch the early morning sunrise and soak in the refreshing sounds of nature. West Bay is laid-back and peaceful, so it's a great idea to start your day by setting the tone of your stay. After basking in the glorious realization that you are now truly at ease, find yourself some breakfast. West Bay is overflowing with quaint diners and eateries, but arguably the best breakfast in this district can be found at Vivo. The food is delicious and the setting is even better. The patio sits on the ironshore, just feet away from the glistening Caribbean sea. Divers walk back and forth from the dock that extends from the restaurant's parking lot into the ocean. After a light breakfast, make your way to the Cayman Turtle Farm to swim with turtles in a lagoon, see nurse sharks and tropical birds. Slowly make your way around the park and learn about wildlife, the importance of conservation, and Cayman's connection with nature. For some authentic Caymanian food, head to the Heritage Kitchen and enjoy some of the island's favourite, traditional dishes. Stewed conch, lobster and snapper are almost always available, so feel free to indulge on something local, including fresh juice. Take in the incredible view while you dine, which includes the entire stretch of Seven Mile Beach. If you're feeling up to it, explore West Bake on two wheels with the West Bay Loop. Don't worry, these guided tours are not physically exhausting. The three hour excursion is a light ride through the district, with stops at landmarks and various sights. Now that you've seen the area and have gotten plenty of fresh air, it's probably time for dinner. West Bay offers elegant sea side dining at Ristaurante Papagallo, Osetra Bay, Cracked Conch and others, so if you're looking for something fancy, you have a lot to choose from. Enjoy your evening at any of these fantastic destinations by the water with a glass of wine. As the sun rises, finish your morning coffee and prepare to explore the beach in a way that you'll never forget. 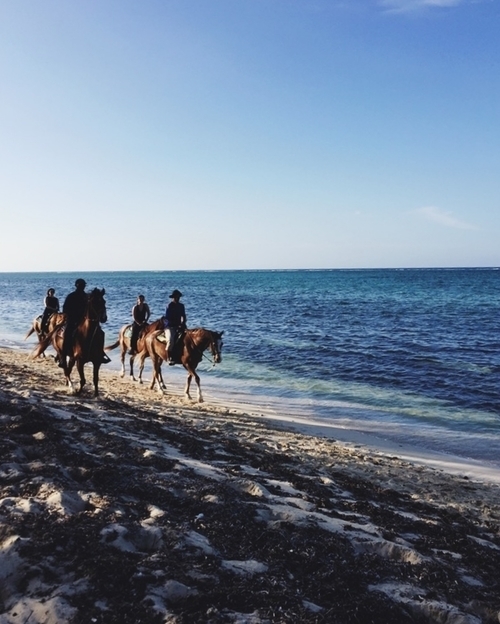 Saddle up and take in the sights on a horseback guided tour. Take your stallion through the warm waters of West Bay, popular with tourists, this is a great opportunity for photos. You don't have to be a skilled rider as this activity is more of a peaceful jaunt through the sands and waters of Barkers. For more photo ops, make sure you check out Hell, a natural formation of dark, jagged limestone. Now that you're good and hungry, have a seat at Macabuca's outdoor bar and restaurant. Very popular with both locals and visitors, it's known for great food, cold drinks and exceptional snorkeling and diving. So gear up and explore the waters, including a mini wall, and enjoy the vast array of marine life that this area has to offer. Get refreshed after your dive by sipping a cocktail and chatting with other divers about their experiences. You'll likely meet some locals that are curious to hear your story, which is all part of the island charm. You can spend a whole afternoon here, and you just might want to do that. If you're looking to stay by the water and soak in the amazing sights, you have a access to one of the best sunset locations in Cayman. Have a seat on the patio at Alfresco and watch the sun melt into the Caribbean Sea. After dark, the patio lights add to the already romantic and serene atmosphere, so stay a while. If you're feeling like shaking things up a bit, head into town and spend the morning on Seven Mile Beach. Jump on a jetski, go parasailing or stroll along the shoreline, it's one of the most famous beaches in the world and as soon as you see it, you'll see why. Grab lunch at Ragazzi in the Blue Plaza and try one of their notorious authentic Italian pizzas, then head to George Carvahlo and book in a Balinese massage to really feel like you're on vacation.